An emergency meeting summoned by the Lakeside Community Planning Group last night filled up the room at the community center in a jiffy with several dozens residents. Two county employees came to present the latest draft of the new Zoning Ordinance and County Code Clean Up. Noah Alvey, a planner with the county, answered questions coming from a fired up audience. During the previous meeting last September, the majority of participants voted to stimulate the construction of single-family homes throughout the rural areas versus multiplex and other types of high-density housing units. At the end of the meeting last night, one participant concluded: “We lost single-family units with this plan.” The resigned conclusion belonged to Janis Shackelford, voted citizen of the year in 2018 for her involvement with Lakeside. Shackelford and her husband, Gordon, pored over a stack of documents trying to make sense of the new changes. A controversial concept in the update stated, “if a single lot has a fraction of a dwelling unit (0.5 and higher) then it can be rounded up to the nearest whole number in order to encourage housing production." Gordon Shackelford contested the claim, pointing out that the fraction conforms with the General Plan densities, while rounding up the numbers would go above the approved maximum. Lakeside Planning Group voted unanimously to oppose changes. Asked to clarify what data was used to determine the affordability factor for Lakeside in order to justify an afflux of new urban development, Liberman said the county used the standard formula from the US Department of Housing and Community development. “ If you’re paying more than 30% of your income on the housing, then that housing is not affordable,” said Liberman. Another controversial issue targeted the new change regarding a “3 feet setback” for housing units instead of 5 feet. 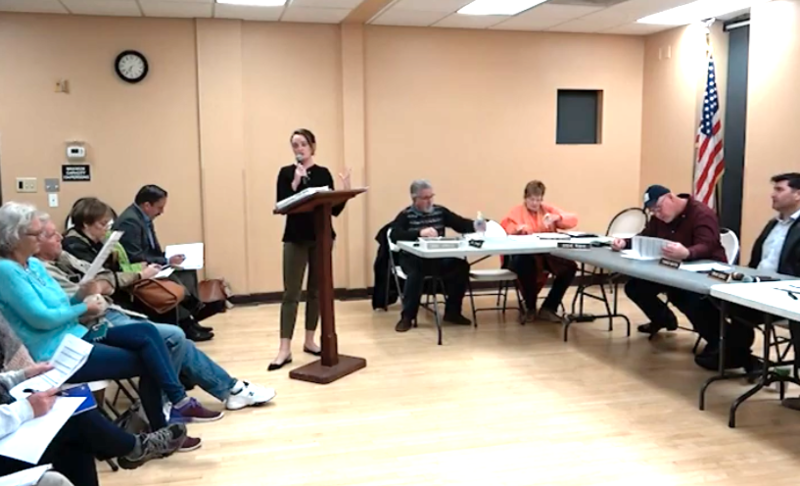 Planning group member Alevy mentioned the fire safety concerns, pointing out, “I think all of this is driven by the state and the state continues to be driven by a small circle of people in San Francisco where there’s a high density and 3 feet there may feel expansive. This is not something that is consistent with the nature of our communities.” Liberman said the new constructions would have to comply with the fire code for a specific area. The Lakeside Planning Group has an advisory role with no voting power to influence the decision of the board of supervisors on any of these matters. After the meeting, one board member said off the record that this meeting was just a box checked by the county to claim they value the community input, but the decision is already made. The San Diego County board of supervisors will have two public hearings about the new changes in the housing ordinance on February 27 and March 13 at 9:00 a.m at the county’s building. Feb. 23, 2019 @ 7:55 a.m.
Aw for crying out loud leave Lakeside alone. We need rural areas and they don't need any multi-family low income housing. There is no such thing as affordable housing in San Diego County. Feb. 23, 2019 @ 11:07 a.m.
Feb. 24, 2019 @ 7:03 a.m. There is a difference between "low income" housing and "affordable" housing. Affordable housing is a scam used my developers to get special financing and zoning waivers by offering a few "affordable" units. Low income housing is HUD/section 8 income qualified housing. Feb. 23, 2019 @ 3:31 p.m. While communities got a short reprieve with the failure of SB 827 in the last legislative session, the developers and their shills continue trying to remove the last of protections and local input. The new version, SB 50, softens some of the original wording, but would still give away what's left of the store. Which is why "charities" funded by the developers are hard at work, illegally lobbying legislators in Sacramento, and recruiting ringers to run for election to local community planning groups. Feb. 24, 2019 @ 7:01 a.m.
Feb. 25, 2019 @ 7:34 a.m.
and knowing they are owned is bad enough without knowing who owns them.